Ryoga Hibiki was a 16-year-old boy who always got lost. His horrible sense of direction was a genetic "infliction" passed down from his father. The only one at his house who did not get lost would be Checkers, his pet dog in the manga. He could never find his way in his first time, (well actually, he had to find the place twice to get it) but it took him days or even weeks to find his destination. - Wearing: Wore gold tunic, black belt, black pants with contrasting lacing up the lower legs, black soft slip-on shoes, yellow-and-black headband around his neck. Carries monster backpack and bamboo-look umbrella. - Weapons: Slang headbands, wielded a heavy, sharp-rimmed umbrella, and used his belt like a blade. - Bakusai Tenketsu: Ryoga learned the breaking point technique from Cologne, Shampoo's great-grandmother. The breaking point technique will make anything shatter/explode with the strike of one finger. The technique, however, does not work on people. - Shishi hoko-dan: Pronounced Shishi h^ok^o-dan, (lion roar shot). A technique of projecting one's fighting spirit in what is known as chi. It focuses on heavy, depressed feelings. The heavier the feeling, the bigger the blast. Ryoga is a master of this techniques because he tends to be naturally depressed. Ryoga considered Ranma as his enemy for what happened to him in China. Ryoga and Ranma were classmates in junior high. When they were small, Ranma had a habit of grabbing away food before Ryoga could eat it, so Ryoga built up a great hatred to Ranma. For this offense, Ryoga challenged Ranma to a fight in the vacant lot behind his house. But Ryoga, who has absolutely no sense of direction, could not find the place until four days later. As Ranma could not meet Ryoga for the fight, he gone with his father for a training expedition to China. But from Ryoga's point of view, Ranma didn not show up for the fight. Ryoga decided to follow him to China in order to take revenge. 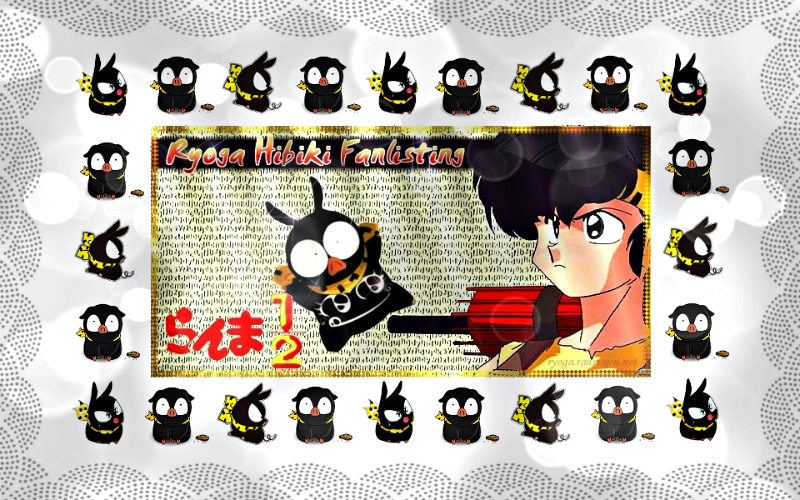 Ryoga followed Ranma and eventually found his way to Jusenkyo (Thousands of Cursed Springs). He was knocked off into one of the cursed spring (the Spring of the Drowned Piglet) by a pigtailed girl (The cursed form of Ranma) who was chasing a panda. He was transformed to a small black piglet when meeting cold water. The panda found this little pig and tried to cook him for dinner. Fortunately, boiling water reversed his curse back to a boy and then left before he was eaten. Ryoga eventually found Ranma back in Japan since Akane was Ranma's fiancee, and Ranma's father, Genma brought Ranma to Akane's house and lived in there. Ryoga tried to take revenge for several times. He ended up in Akane's room in his cursed form. Akane found him very cute and adopted him as her pet P-chan. Ryoga had been smitten with Akane ever since she kissed him (as P-Chan) the night she found him. Ranma soon discovered P-chan was Ryoga, but he had swore to Ryoga not to reveal Ryoga's secret. Besides, Ranma's pride would not allow him to tell Akane since they always mumped with each other. Ryoga fell deeply in love with Akane but he was unable to express his feelings to her. He was terribly shy when it came to girls, partly because he felt no one would love him with his curse. So, he did anything that he could do to keep this in secret. And despite several close calls, Akane was unaware that the pet pig she slept with was Ryoga. Akane also had no clue to Ryoga's feelings toward her, only feeling that Ryoga was always very kind. She got angry whenever Ranma abused P-chan, and chided him for being jealous of a pig. He also liked Akari Unryuu. Jusenkyo was a legendary training ground in China that had over 1000 cursed springs (not exactly a AAA approved vacation spot). Each spring had a tragic story of something that drowned in the spring centuries ago. From now on, when someone fell into a spring, they became whatever had originally drowned in the spring. The Spring Ryoga fell into was the Spring of the Drowned Piglet, this Spring carried the tragic story of a baby black pig that drowned there 1200 years ago.